Every business claims they focus on customer service and offer the best to their clients. However, how many really do? If you want to be able to stand out from the crowd and offer truly great customer service instead of just empty promises, here are ten great tips that will help. There are two ways to fix every problem. The immediate solution is to take care of the customer, leave him or her happy, and go on with your day. However, there’s a reason this problem happened. You need to consider how to prevent it from happening again. Your business will be more efficient and you’ll have happier customers overall. Treat your customers like human beings. That means treating them with dignity and not being annoyed at them for interrupting your day. This also means expecting them to act like responsible adults. Too many businesses believe that good customer service means bowing to the whims of every customer with a complaint. That solves the immediate problem of an angry customer, but sometimes it’s not for the best. Know when there’s a real problem that needs fixing and fix it well but don’t let people walk all over you. 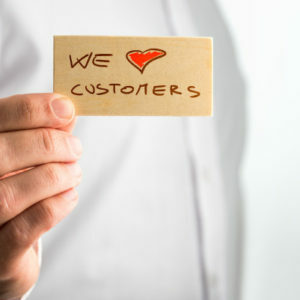 Go beyond the minimum to make your customers love you. If there’s a real problem, and you can do just a little more to make a customer’s day, he or she is going to remember it. You’ll get a lot more repeat business and word of mouth advertising if you over deliver. Don’t make excuses. If it’s your fault, say so. Don’t try to blame it on the customer, the circumstances, another vendor, or the position of the moon in the sky. It’s amazing what a difference it can make if you just say “An error has been made, but I will make it right”. Your customer will see you a lot differently if you don’t make excuses. Don’t take it personally! This one’s easy to forget because the customer is directing their frustration at you. However, the customer is angry about the situation, not angry at you, specifically. Taking things personally introduces anger into the situation and makes it harder to fix the problem. Listen to your customers. Don’t assume you know what they want. They may have some good things to say, even if they’re not experts. Think about what you’re promising. It’s easy to get carried away and offer more than you can easily deliver. If your business is racing from one project to the next, you can’t offer true quality of service. Don’t let this happen. Always pay close attention to what you’re promising, and don’t let a customer talk you into the impossible. Allow the customer to feel like a priority. Don’t answer the phone while filling out a spreadsheet – you’ll sound distracted. Spend the few minutes it takes to really pay attention. Your customers will know the difference and the results will be worth it. Get to problems right away. No one wants to deal with something unpleasant, but if you let a complaint sit, it’s not going to get any better on its own. Follow up! Call after a problem’s been dealt with, or after a customer has received a particularly big order, to find out how things went. Don’t try to sell anything during this call or email. Just find out what you need to know and wish your customer a good day.